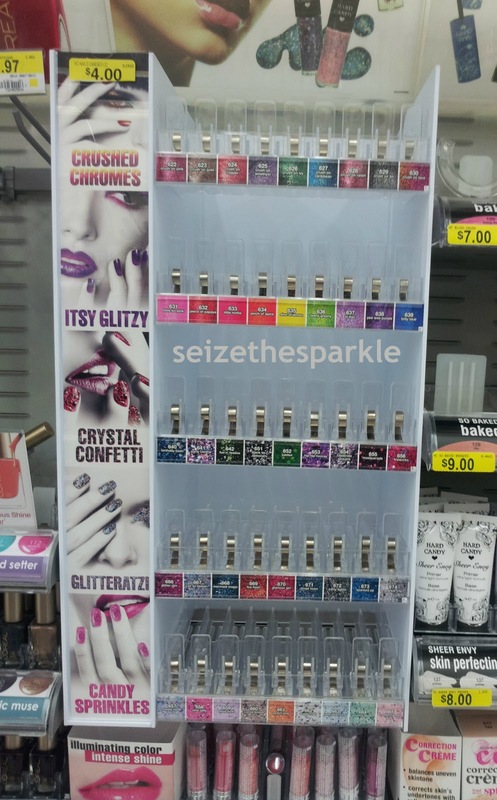 Hard Candy Nail Polish Display! Let the beauty department stalking begin! (L to R:) Party Central, Jubilee, Black Tie Optional, Peach Pop, Piece of Papaya, Little Bo Pink, Masquerade, Sugar Rush, Gummy Green, Hip Hip Hooray, Pink Taffy, Crush on Gold, Crush on Lava, Fun 'N Festive, Fireworks, Cotton Candy Pink, Fire Flash, and Glitter Jam. My top 3 include Black Tie Optional, Jubilee, and Party Central. 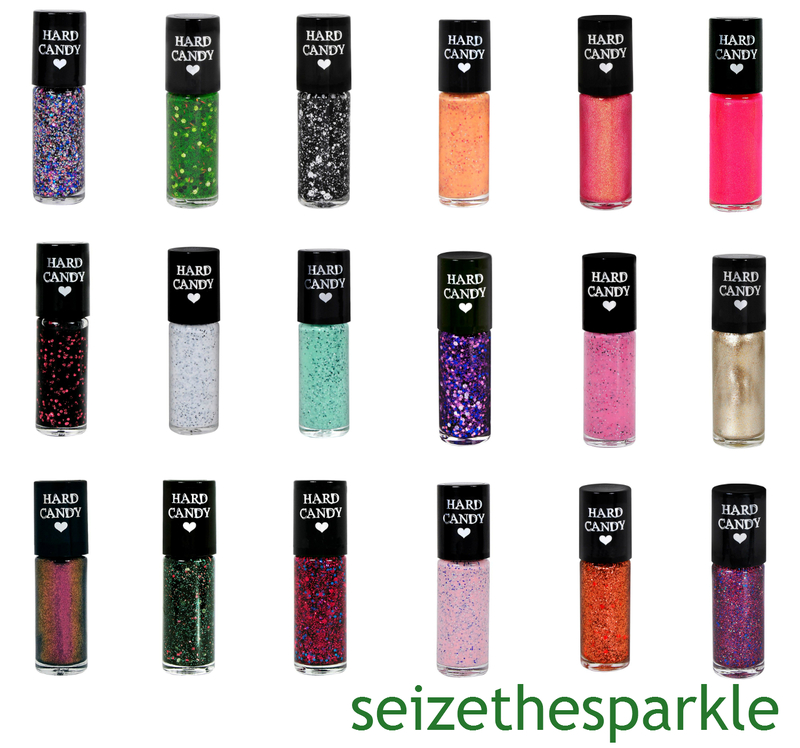 It's about time for an affordable and wearable black and white glitter from a mainstream company! Jubilee is all kinds of fun in a bottle, and Party Central looks like it will be amazing to layer with. I'm really impressed by this collection. Hard Candy obviously took the time to do their research, because a lot of these polishes look like they should be coming from indie brands, not a mainstream polish company. 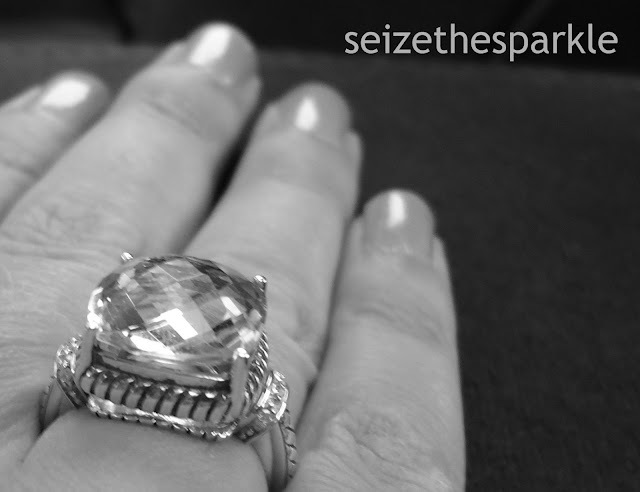 It's a great time to rejuvenate the line, and while you might be sad to see the rings go, the sheer originality of these shades make up for it. Personally, I can't wait to snap up my faves from this collection! The best part is, at $3.97 a pop, you can pick up quite a few polishes without too much wallet damage! 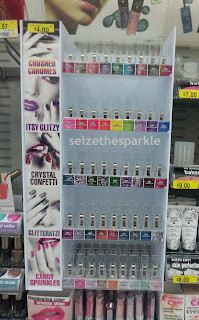 Hard Candy polishes are sold exclusively at WalMart, and I've been on the hunt at my local stores each time I visit! For a complete look at Hard Candy's Spring 2013 Collection, visit their Facebook page. Which shades are you planning on adding to your collection? Have you spotted any yet?!? I apologize for the lack of pics on this one... Initially I wasn't too thrilled with how this polish turned out, but it's growing on me the longer I wear it! If you've ever hunted for the perfect yellow... I'm sure you understand my plight! 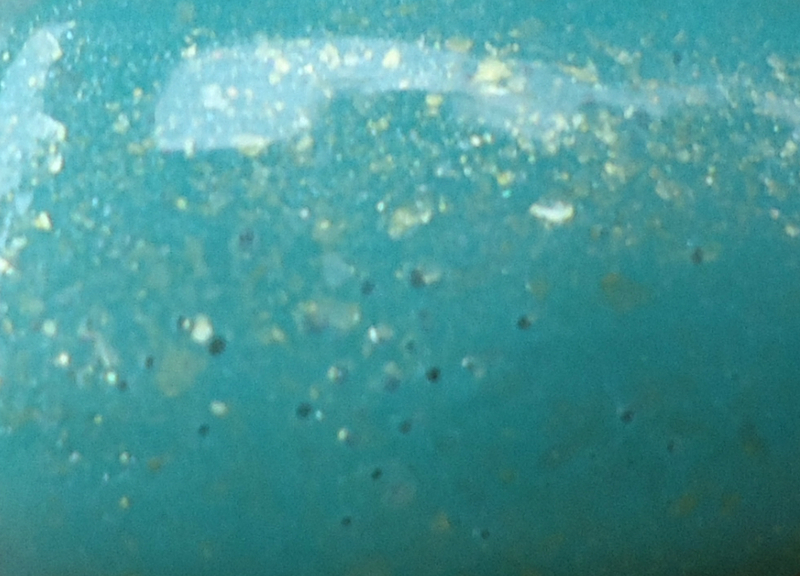 So I don't have pics of either of these polishes on their own, and this is the only pic I took, because I didn't really like how this turned out at first. Yellows are known to be streaky little buggers, and Unicorn by Sinful Colors is no exception. 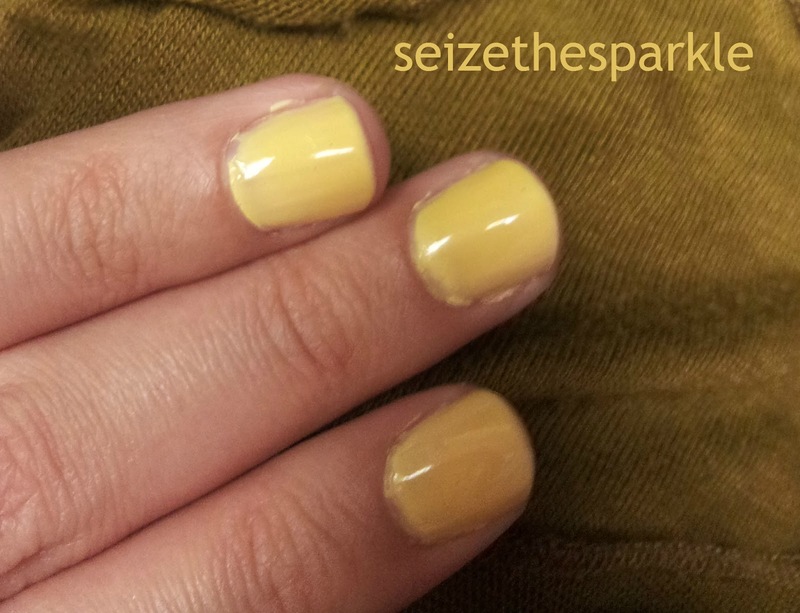 I really wanted to wear yellow polish, so I originally tried Designated Driver by Spoiled. I remember loving that shade when I bought it, but it was doing absolutely nothing for me this time around. So I reached for Unicorn by Sinful Colors. Unicorn is a chalky pastel yellow color. Very pastel, chalky, and cool-toned. It did absolutely nothing for my nails or skin tone. Recently I picked up Revlon Crystal Glow, a yellow jelly that's super sheer. It has a warmer vibe to it... somewhere between a banana peel and a really ripe pineapple. It added a lot of warmth to Unicorn, creating the shade above. It also evened out some of the streaks, but obviously not all of them. This mani is brought to you by my OTHER Valentine presents... two bottles of BlackHeart Nail Polish... 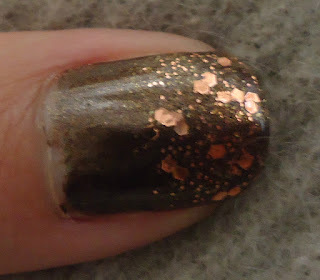 The one I wore over the weekend is Copper... a dark brown metallic polish with a copperish tint. Fitting, huh? 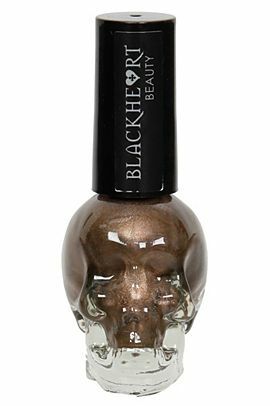 Blackheart Cosmetics are sold at Spencer's Gift Stores. They have a bunch of interesting colors, and something they call "stack" polish. 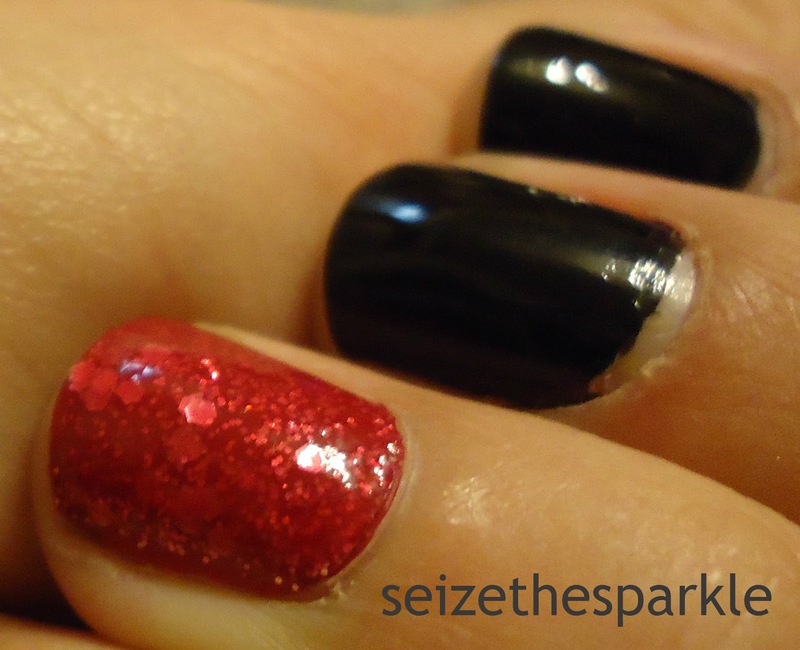 Basically three polishes layered in the same bottle, so you get a little of each color with each dip. While a nice idea in theory, I've never owned a polish like this. I would probably accidentally shake the bottle up or something, completely ruining the concept! Normally, I wear black if I want to be edgy, but this polish had a dark edginess to it too. Dark yet warm at the same time. 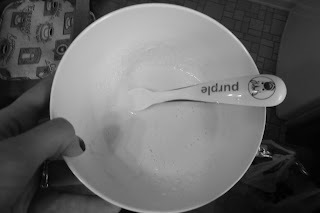 I accidentally bumped my pinky and smudged it pretty badly while sleeping, so I had to take this off after only 2 days. Had it not been for that, I definitely would've worn it longer. This is one of those manis that just went with everything! 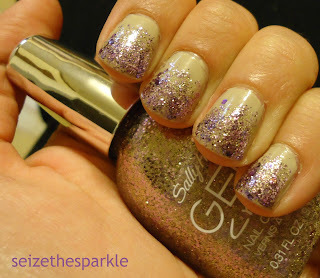 Loved this mani so much... I wore it for 2 whole days! 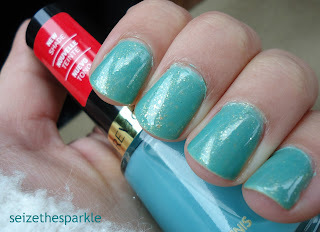 Turquoise + Gold = J'Adore! 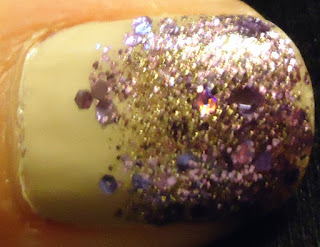 Maybe once I get another gold flake glitter, I'm sure I'll be obsessed with using that. I must find one in silver also. Something about irregular flakies in nail polish makes me all giddy inside. I received a couple of compliments on this manicure, something that always makes my day! 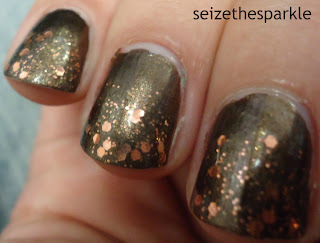 What's your favorite gold flaky polish? Since I've lived in the wonderful little apartment I live in... My closet has been giving me fits. FITS I tell you! It's a decent size and everything, but we live in an older home with seriously outdated closets that we can't change. Mine goes on for a while behind the wall, but it has a standard size door, so a LOOOOOOOT of my clothes are completely hidden. No lie, I sometimes find clothes back there and do a little happy dance because I forgot I owned them. I have puzzled and agonized over my closet. I feel slightly ashamed admitting that, because, well... Who does that? Apparently me! I love a lot of classic preppy European looks... I'm obsessed with adding a French flair to my life and style... I have a crow-like affinity for shiny things (glitter and sequins.) I am obsessed with equestrian boots and could justify buying any pair of bootseses... (don't ask.) I've also come to appreciate lace, bows, ruffles... anything super-feminine, simple and pretty. I'm alllllll about it. It's my go-to style, and if I do say so myself, I rock it REALLY well. That's not to say that I don't go outside of my comfort zone and buy some trendy pieces once in a while. I do, but a lot of times, those pieces sit in my closet unworn, or only come out to play once or twice before I'm on to something else. There's nothing worse than going through your closet and realizing that you wore this one time, never wore that... Ugh. The wasted money just adds up in my head and makes me super frustrated! I'm trying to be deliberate about my life... and the way that I spend money... (hangs head in shame) I'm admitting it. It's not always well thought out or even necessary. I'd like to think I ask myself do I WANT this or NEED this before I purchase something, but that's so not the case. I'm a big shopping-is-therapy kind of girl, and I definitely get a rush out of purchasing new stuff... especially Clothes. Money-wise, I just can't live like that anymore. I have a little Peanut who is not going to accept Mommy's WANTING a new pair of shoes as the reason she doesn't have food. Or diapers. Or both. Peanut comes first, first, first... always and sideways eight. Anyhow, long story short, Caitlin's blog is an in-cuh-redible find. She even did this challenge for a year, which I have to admit, I don't think I could do. I'm scared to do. It's a little more scary that I kind of want to, just to see if I can. I'm a stubborn little individual like that. But enough about that... Back to wardrobes, closets, organization! I'm thinking that I could try this. I'm not sure if I'm going to follow the way she outlines it to a tee... and that might lead me to a completely different name for my version of the series... Can you tell I'm still in the planning stages? I'm definitely excited to try it and you can be sure I'll post my findings here! That's going to require quite a lot more thought. A lot. Like, a lot, a lot! 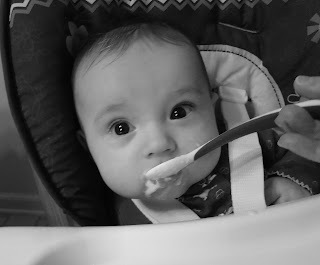 Peanut had her 4 month check up last Friday... Not only did she get a new round of shots (and learn to hit some new high notes) she got the okay to start solid food! Rice cereal here we come!!! Looks like glue. Smells like glue. Tastes like glue. Blech. 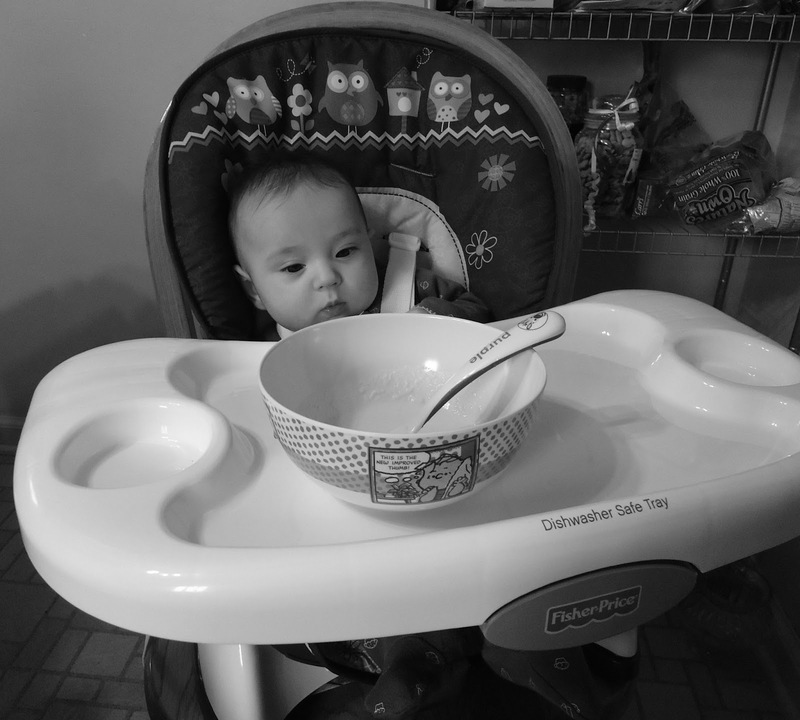 In her big girl chair staring at that biiiiiiiiiiig bowl. Cereal Mustaches are the new black. Final Verdict: Ate half. Wore half. 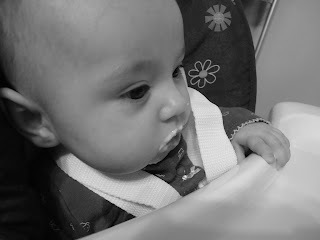 While I still haven't tasted her formula, I did actually sample this to try and make a point that it was yummy and she should eat it. 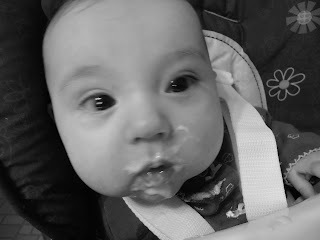 It was not yummy, but thankfully Peanut seemed to think it was! She did really well. And by really well, I mean that half of it made it into her stomach. Not bad for her first try! Not sure what was cuter, her grabbing the spoon and trying to feed herself, or trying to shove her hand in her mouth at the same time that the spoon was going in. Little girl, you have no idea how entertaining and funny you are without even trying!!! This time around, I decided to do a gradient manicure, because it's been a while since I last tried one. 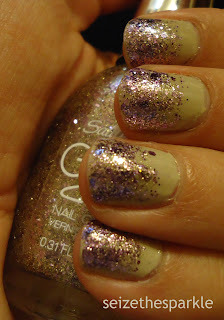 I've worn this combo before, but this time around, I added some Sally Hansen Gem Crush in Big Money in between my larger glitter layers. 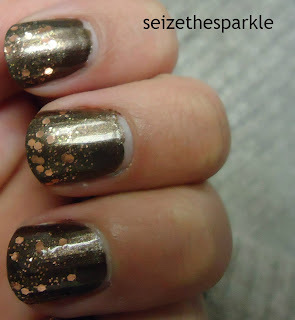 I think it gave this mani a lot of depth, but in hindsight, I would've made it the bottom layer. Also, I would've taken pics in natural light. Oo. 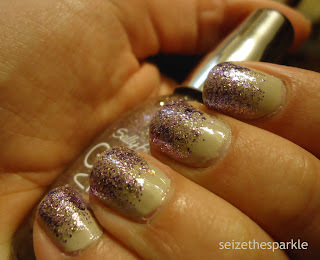 Big Money is an ideal polish for a gradient manicure like this. 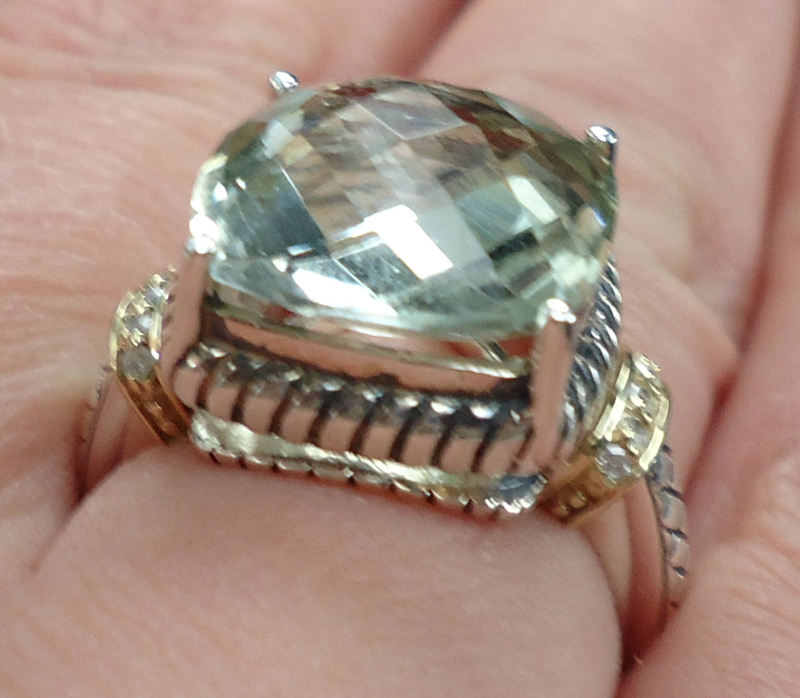 I've tried to get into other shades of the Gem Crush collection, but none of them jumped out at me like this one did. It paired beautifully with Sugar Plum Faeries Gone Wild. 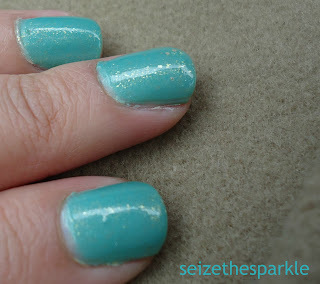 Gradient manicures are a fun take on glitter... A bit more sophisticated and definitely wearable by just about everyone... and they're super easy to do! What's your favorite way to wear glitter polish? 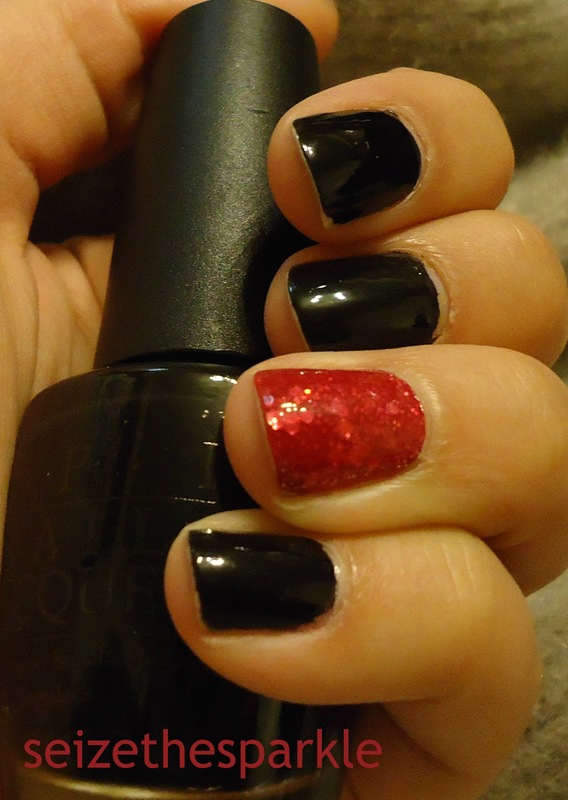 I know it's a little late, but this is my Valentine Weekend manicure. My Valentine's Day manicure was a bit of a disaster, so this one definitely made up for it. In the pics, my accent nail looks red, but it was really a hot pink. Artificial Lighting just doesn't do Conquistadorable Color justice. Sigh. This is a pretty simple manicure. 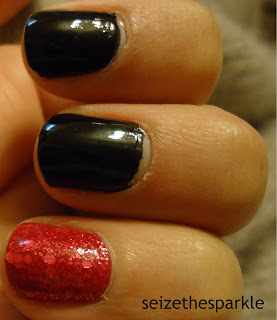 Black and pink, very similar to the very first accent mani I ever saw. I can't tell you the exact season or episode, but Hanna's character on Pretty Little Liars wore black nail polish with red accent fingers. 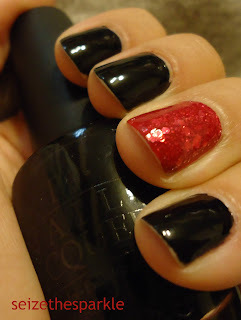 That very night, I mimicked the look with two of my all time favorite polishes, OPI You Don't Know Jacques! and Paint My Moji-toes Red. I've been hooked on accent manicures ever since! 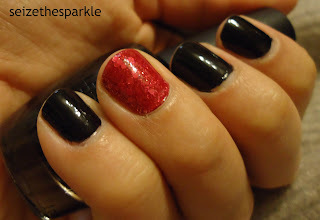 I knew I wanted to wear black polish for Valentine's Day... 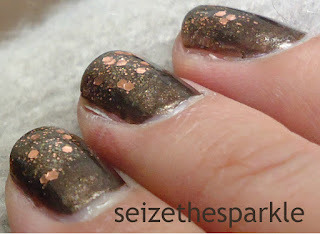 Originally, I planned to accent with one of the Wet n Wild Fergie glitters, but the formula on them is sooooo problematic. I decided to go bold and use one of the brightest pinks in my collection, making a nice jelly sandwich on my accent fingers. I really loved the look of this manicure. What polish did you wear this Valentine's Day?!? I'm not normally the type to brag... But sometimes someone does something so thoughtful and sweet that it just has to be mentioned! My husband and I have had all kinds of different Valentines. If you've read the about me section, you know I've had a tough year and I'm on a bit of a personal quest. That being said, this gift was ABSOLUTELY PERFECT. PERIOD. 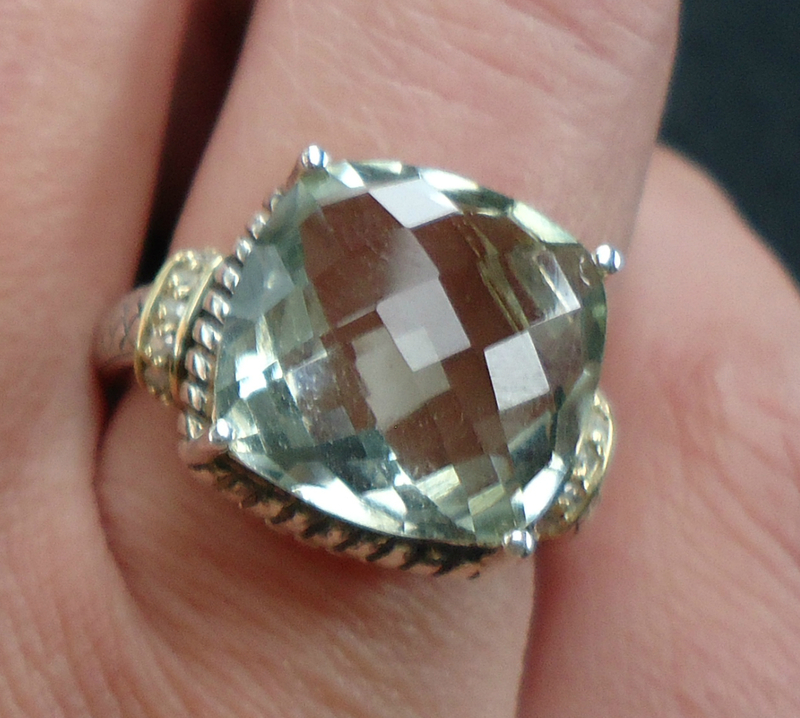 I've always wanted a cocktail ring, and now I'm the proud owner of this sparkling Green Amethyst beauty. But that's not the coolest part. First of all, I was completely surprised to receive jewelry, let alone a ring. It's cool that this is something I love, but probably wouldn't have picked for myself. I've been necklace hunting lately, so that's where my sparkly little head has been at. 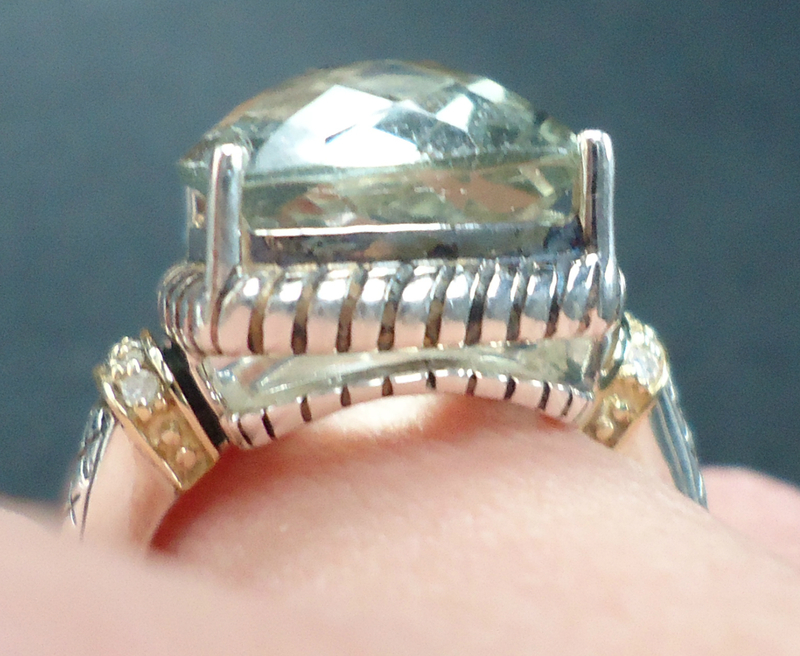 The stone in this ring has some incredibly fitting meanings for everything that's been going on in my life lately. 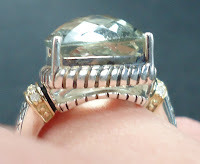 I don't believe in crystal power or anything like that, but Green Amethyst is supposed to cultivate compassion, self-honor, and self-acceptance, clear negativity, ignite love and compassion in the heart, and strengthen the emotions, mind, and will. Can we say extremely appropriate? I don't know what better gem to gift someone on a quest for positivity and meaning than this. Seriously. How did your sweetheart sweep you off your feet this year?! ?